7 Quick Takes Friday: Mr. Bean is Bombastic | House Unseen. Life Unscripted. I had all these grand plans of writing something hilarious and useful (yes, both at the same time. I always have been an overachiever, what can I say?) but now the sun is shiiiiiiiiiiiiiiining after two days of raaaaaaaaaaaaaaain and all I wanna do is get out there and DO something. So, I'm doing 7 Super Quick Takes (kinda like 7 Quick takes, but super duper fast and quicky quick like) Friday and then I am blowin' this indoor popsicle stand. Why does Blogger want me to capitalize the word "popsicle"? Is that a brand name or something? What do they want me to call it? Frozen edible sweet liquid cylinders? "Let's blow this frozen edible sweet liquid cylinder stand!" Speaking of words being denied their wordliness by being given a red squiggly where it doesn't belong: doofuses. Yep, there it is. A red squiggly. It's a word, y'all! I looked it up and everything. If the internet, which clearly knows all there is to know in this world, says it's a word then it's a word. I'm using it, dang it. Speaking of words again, do you know what's a shame? My kids don't know what the word 'bombastic' means. No, not the real meaning, silly. The awesome meaning. Clearly they have not been watching enough Mr. Bean and/or listening to lame 90's music. Or maybe watching enough Beavis and Butthead. Holy cow, have you guys seen this sped up version of the Mr. Bean dance? I really do need to find a way to spend more time on YouTube. This is comedy gold! Okay, remember how this place was a jungle when we got here last summer and Tommy had to excavate a path using his favorite machete and a prayer? Well the jungle is coming back, and do you know what it's made of? Wild grape vines! We got here too late last year, but maybe we'll actually get to try some grapes this time around. And then maybe we can figure out how to turn them into wine. Have you met me? Yes, I AM that cheap! And just look at this. We have real trees! With a tire swing! And sunshine! And a boy with shorts on! Click to link-up with Jen! Sunshine. A boy. And a tire swing. Does life get any better. Thanks for sharing this seemingly ordinary joy. I love how your joy comes through in everything you write. You're making me wish I had a backyard with a tree and a tire swing. Happy Friday! I saw your title and laughed. I wanted to yell "Get out of my iPod!" because that song was playing about 30 seconds ago. And then you went and called it lame 90's music. Now I'm a sad panda. At least "Let's blow this frozen edible sweet liquid cylinder stand!" cheered me up. Somehow, some way, I'm going to use that phrase today. Oh no, sad panda! I am the QUEEN of lame 90's music! Popsicle is a brand name. Gotta P it. Hooray for shorts!!! And grapes!!! My computer is frequently squiggling my words. I think it might in fact be a doofus. Seriously, someone needs to find out what they are. Like Band-aids are "adhesive bandages" and Kleenex are "snot rags". What the heck is a Popsicle?!?!? Oh, that Mr. Bean is s.e.x.y! I need to take a page from your book and get the heck outside. I want to put shorts on like your boy, too, but that would require the shaving of the legs, and I'm not sure that I'm ready to let go of the winter coat just yet. :) Have a fun day, buddy!!! Lol! Those videos made my day happy. Also, I want to go swing on a tire swing. That looks like sooo much fun! Love these! You're right, life is good. Love your run down of everything :) And the fact you used ya'll! Awesome. Hope ya'll (see, I did too!, ha) get a chance to get out of the house this weekend. No more rain, no bueno. Have a great long weekend!! I love the variety today. Yes Mr. Bean and hyacinths in the same post...wunderbar! Yes, it's underlined in red...but so is dialogue. Weird. What a fantastic post! I'm with you. The sun is finally shining and the LAST thing I want to do is stay indoors sitting in front of my computer. But I also love writing, so I'm in a bit of a pickle here. LOVE the tree with the tire swing! Faith was just asking me the other day if we could get a tree with a tire swing when we buy our next house. I replied..."Ya baby...you're getting a tire swing for sure!" Life IS good, Dweej,and so are you! Those freaky door-wall people! They're everywhere. Thankfully I am not one of them...because hello, I have watched television and read magazines in my life and guess what? They aren't called door walls! That song was the jam! See I keep telling my kids, they just don't know good music. I've been practicing that Mr. Bean dance all day long! Door wall? What? Anyway, I have to comment because I love lilacs. And in my Michigan experience, there are people who called them "Lilox." I find that very strange indeed. Love that boy on the tire swing. As usual, you have coffee almost squirting everywhere from "me" laughing way toooooo much! Enjoy the sun and I am so jealous of the tire swing and the shorts! this video has provided my entertainment for the entire weekend. thank you for that. if you would like to provide my entertainment for the next week, feel free to post a video of yourself doing the boombastic dance...since you have been practicing. You are not the first person that has suggested I post a video of me doing that dance. Perhaps I should do a thank-you to 200 subscribers by performing this dance with my (unsuspecting, soon to be totally embarassed) children! "Hi there! I really enjoy this site...now follow me back"...BWHAAHAAA! Seriously, though, i LOVE LOVE LOVE Mr. Bean!! I can't believe I missed this post, although Google Friend Connect has been messed up lately. It's a real garden, Charlie Brown! The World is Good. People are Awesome. I figured out how to count. We have a WINNER! Sorry, Sid. I hate you. Why Michigan? part 2. And don't think I'm fancy! 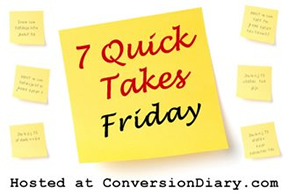 7 Quick Takes Friday vol. 3: I'm guest posting! Webby Wednesday: Unrepeatables with Giveaway!